Last Monday, we had planned to pour the concrete to form the slab floors for the new house. Sadly we were thwarted by freezing -6C temperatures and 2 inches of snow. 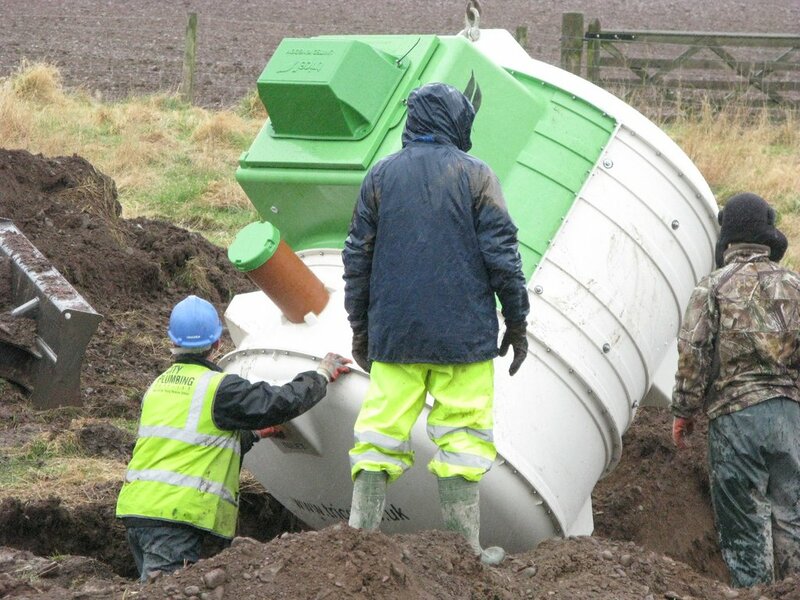 But that didn’t stop the delivery driver for the sewage treatment plant. I’d been out for a walk after deciding with Stan that the concrete was a non-starter. I got back to find a new set of tyre marks snaking round the lane to the plot. I was trying to work out who it could be as I walked round the corner. It quickly became apparent as a large wagon slid the final yards down the slope to a standstill perched on the very edge of the 3 feet deep service trench by the side of the lane, held up by the remains of the fence. 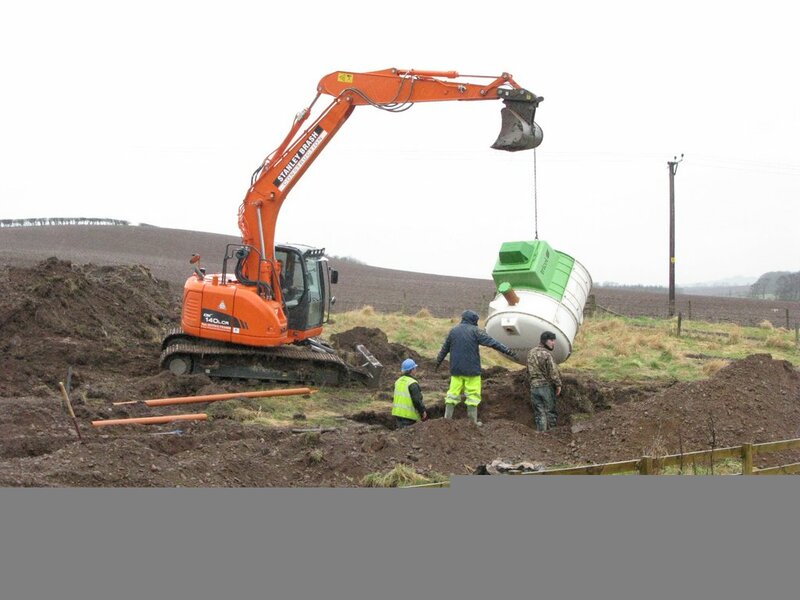 As Stan made his way over to the site, the wagon driver used the four wheel drive fork lift to tug his vehicle clear of the ditch. 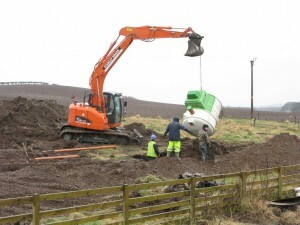 We’d just got him manoeuvered round to terra firma when Stan turned up, unloaded the treatment plant and trundled off to the end of the field with it. Dumping it unceremoniously on its pallet, he explained that he’d install it when they came back to do the concrete. The concrete company had promised a delivery for 7.30am and with much grumbling the lads turned out for a quick morning’s work. When it became apparent the concrete was not going to arrive anything like on time, they turned their attention to the treatment plant. In what seemed like seconds, Stan had excavated a chasm about 3 metres cubed (10 feet long, wide AND deep). Lining it with a layer of pea gravel, he gingerly lowered the treatment plant into place. 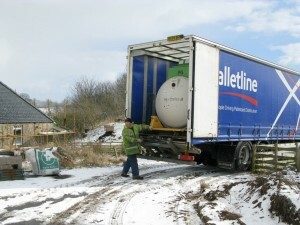 Brian and Chris levered it into position, and with a gentle nudge of the fork lift, it settled on the gravel. A couple of adjustments and it was levelled out. 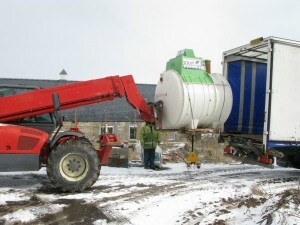 We found a water supply that hadn’t frozen in the week and started filling the 4000 litre tank so it stayed in place as we poured more gravel round it. Brian explained that if you didn’t weight the thing down, there was a good chance of it floating to the surface under its own buoyancy. 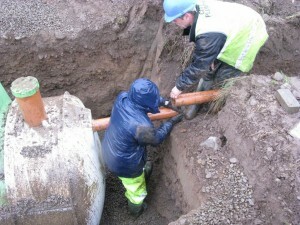 The final connection to the foul drain was made, and slowly the tank disappeared under a layer of gravel. Then some of the soil was replaced around it leaving just the inspection hatch and the compression pump canopy. The last job was to dig and line the foul soakaway downstream from the treatment plant. Another hole 3 metres square was excavated and lined with a permeable membrane. 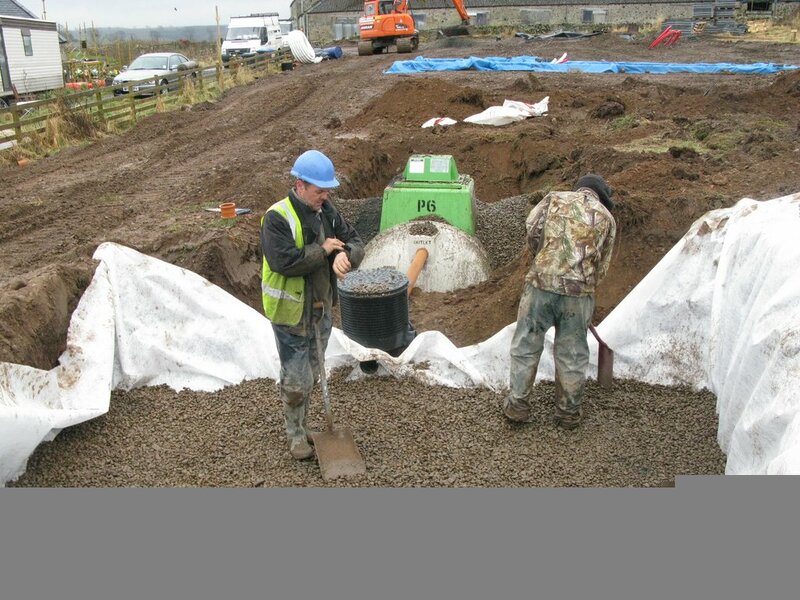 This was filled with a layer of gravel on top of which a complicated arrangement of pipes were laid ready for another layer of gravel. 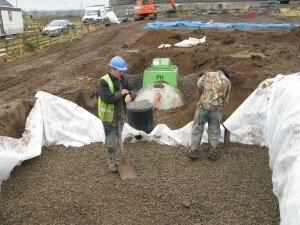 The membrane then gets folded over the top and the whole thing is covered in soil. 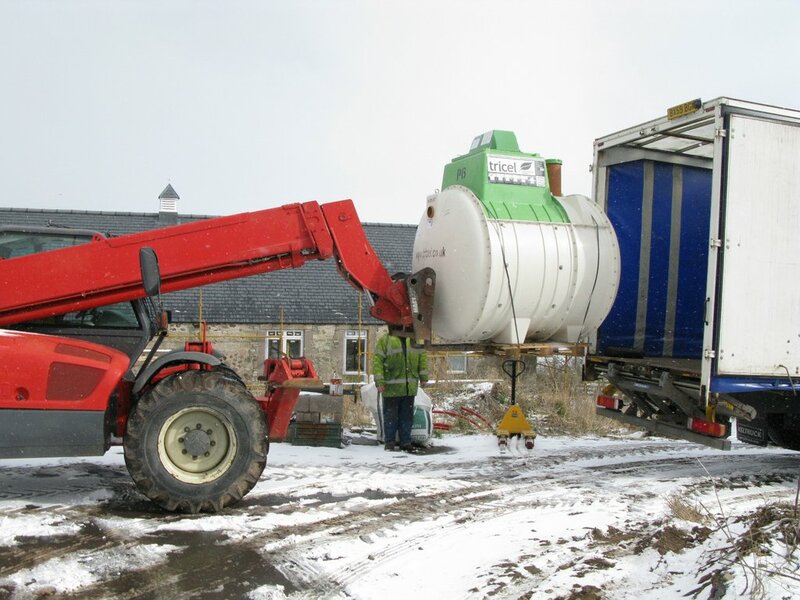 2 Responses to "Installing the sewage treatment plant"
You did leave access to desludge didnt you. Good thought! But yes there’s going to be room down the side of the house. The hose for the desludger is 30metres or so and we’re just in range of that.